We talk about her songwriting, getting by in the music business, and her current U.S. tour. 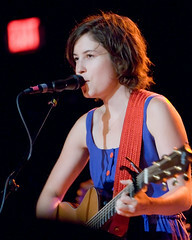 Missy Higgins is steadily making a name for herself in the U.S. Her second album, On a Clear Night, was released last year in the U.S., and since then her singles have been gaining ground in the TV soundtrack and radio markets. 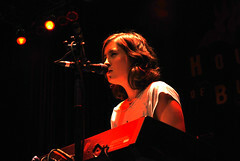 All the while, Higgins continues to tour and write, and is preparing to record her third album. I spoke with her this past week, on the eve of her current U.S. tour. Have you ever thought of doing anything besides being a musician or songwriter? Yeah, I have. I've been [thinking about it] a lot lately, for some reason. I don't know if I could settle into any other career long-term that wasn't something to do with the arts or music. I think if I end up doing anything else it will have either something to do with the environment, activism, or some off-shoot of the music industry. I have a desire to study and learn about different things like Aboriginal culture, the environment, theology, psychology, or literature. I want to start exercising that side of my brain again because it's been lost in the rubble over the years. Do you think you would ever take time to stop what you are doing right now to do that, or are you going to try to incorporate that into your life as a full-time musician? I think I will take time after this album is finished in the States. I'm planning to take a bit of time off in Melbourne. What do you when you're not touring or recording? It sounds like you're going to be studying some things…. I read. I rock climb. I recover and get ready for the next tour. I don't seem to be ever taking breaks that are very long. It's usually just a big intake of breath before I step out and do it all over again. What inspires the things you write about? Human connection, and my exasperation at the human brain and how many different forms it likes to take, and all the unpredictable directions that it takes and how that makes me feel. Self-analysis, a lot of the time. Human relationships in some form or another. Have you noticed any shift in your writing process over the years? It seems to become a little bit harder when you're in the middle of promoting yourself. It's hard to get the promotional side of the industry out of the creative sphere that you need to work in. It's a battle to push that side of things out of my head when I'm trying to write a song. It's a constant effort to keep myself in a space that's creative. It's possible, but it's just more of an effort these days. How has your experience with the U.S. music market been different from your experience in Australia? It's a huge country over here and there's so much going on. There's so much great music that sometimes I feel a bit swamped in it, but that can be amazing as well. At the same time I get to see so much great music come through and be amongst it all. As a result, I'm constantly being humbled and inspired to be a better performer and songwriter. It's definitely a different game. It's much harder, but essentially much more rewarding when you do make some progress. Have you had to change your approach to things in order to connect with this particular music audience? No, not really. I think if anything I'm being more myself on stage these days. I don't know why. I think I've kind of settled into my songs and myself as a performer now. Something about American audiences gives me a lot of confidence on stage to open up. I find Americans to be very accepting and willing to be entertained and taken on a journey during a live show. They're not so quick to judge, I guess. Are American audiences adjusting to your no-encore policy, or are you finding it difficult to maintain that? I don't really know, actually, 'cause I don't hear all the mumbles as people walk out of the venue. I'd be quite curious to see what people think of that. I think I'm getting to the point now where I don't feel as though I have to announce it at the end of every show, but I do feel like it goes down better when I explain that I'm not going to do an encore and it has nothing to do with them. It's just that I really don't like doing encores. I saw you at the Birchmere last fall. It really struck me because I liked that it was very clear that this was the end. We don't have to pretend that we really like it so that you'll come out and play the songs that we wanted to hear. It was like, "Okay, this is what I'm giving you. You might want more, but this is it." I really appreciated and respected that relationship with the audience. That's cool. I guess my whole thing is that it's quite an honest concert and I don't put on any sort of fakeness on to entertain. My entertainment is to stay purely stripped down on stage. It's the same with my songs and my lyrics: it's all about opening yourself up and connecting with a whole bunch of strangers. That's what's so therapeutic about it for me. Doing encores always felt a little bit contrived and cliché. I wanted to take that aspect out of my show, and I felt more real afterward. We'll see if it keeps working. I know audiences in general seem to love encores, so maybe one day I'll succumb. It's almost expected, and often it's not just the one encore. We have to have two encores now. When does it end? I love the idea that in the olden days it wasn't expected at all and if the audience just couldn't bear the fact that the artist had finished their set, then they would beg for more. If the artist felt like the audience wanted it badly enough, they would come back on. Now, people leave songs out on purpose so that they'll have to be clapped back on. This completely defeats the purpose. I want to ask you about the new video for "Where I Stood." Why did you (or your label) decide to record a new video for it? …whatever channel still happens to be playing videos? Yeah, exactly. It was one of those things to keep people interested. One of the things I appreciate most about the video for "Steer" is that you're not depicted as a delicate flower or hypersexual, like most female singers tend to be in modern music videos. Given that [the record label] felt like they had to change "Where I Stood," do you think that might happen with "Steer" if it's ever released as a video in the U.S. market? I don't know. I hope not. If we do redo the video for "Steer," which we probably will because… oh, actually, I don't know if "Steer" is going to be a single, so…. Really? I love that song! It's my favorite one on the album. Oh, thanks! I don't know. They have their theories about what works as a single and what doesn't. It's definitely a contender. There's talks about it at the moment and people can't decide between a few different songs. If we do it again, I hope that it has an edgy feel to it rather than be completely Hollywood-icized. But, I think that's a little ways down the track. We'll see how "Where I Stood" does first. There's a whole business side to things that I just don't understand. You're about to start out on a four-week tour in the U.S. — what do you do to prepare yourself for a month (or more) on the road? I pack a huge suitcase full of things that I really don't need. I stock up on healthy, vegetarian snacks that I will probably need when I get to middle America and find that I can't eat anything. I bring books, DVDs, my computer, and good music. And don't do enough practicing. I see all my friends and I tell them goodbye for probably 150th time and tell them I'll see them in a couple of months. Are there comfort things that you can't do without? Sadly enough, I probably couldn't do without my laptop, although I just went without it for five weeks over Christmas and it was awesome. I loved it. I couldn't do without my books, definitely, and my diary. Are there any venues or cities you are looking forward to playing? I always love going to New York. I'm really looking forward to playing the Stonewall in San Francisco. That's the one I'm looking forward to playing the most. I've supported so many people there over the years and to have my own headline gig there is really a dream come true. I love that place. That's all the questions I had for you, and we're running out of time as well. But, I wanted to tell you that I was at my local karaoke bar on Monday, which I like to go to often, and I discovered that in the new selection of songs, they have "Where I Stood," which just thrilled me. Wow. I've finally made it! That's it right there. The pinnacle. Wilco gives an ecstatic sold out crowd in Seattle The Whole Love.